Unfortunately most building codes that apply to straw bale construction require you to use the 14 gauge 2″x2″ welded wire mesh because it provides protection from shear forces. 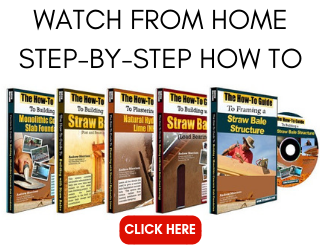 This is why it is the preferred system of most straw bale builders and the shear system I describe in the comprehensive DVD. Sort of. 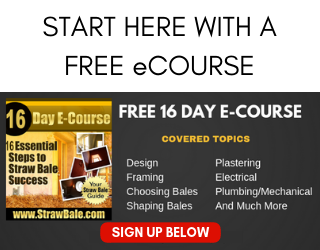 If the plaster is at least 1¼” thick, it will help keep direct moisture off the bales. Be sure to use a plaster that breathes or the problem will be made worse. I like the Natural Hydraulic Lime (NHL) shown in our Comprehensive DVD. It does a great job as a breathable material and reduces most if not all moisture problems. There are two main ways to protect against rain splash. 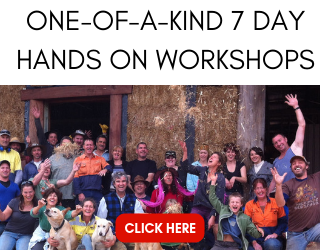 The first is to use a house wrap or building paper around the bottom three courses of bales. Simply staple the wrap to the bottom toe up under the bales and then use landscape pins to hold the wrap in place along the top edge. This works fairly well. The other option is to build pony walls that actually raise the bales away from the floor by about 2 feet or so. Two feet is a good number because you can use one piece of either drywall on the interior or plywood on the exterior ripped in half to cover twice the distance in sheathing. This also provides a chase for all the wiring and plumbing in the walls. You can use the space below the pony walls (short framed walls) to run all of that stuff while avoiding the bales entirely. Plastering the ceiling is very much the same as plastering the walls. The biggest difference is you need goggles and a big hat! Okay, that’s not entirely true. You will likely drop a lot of plaster in the process, so glasses and a hat are a good idea. The ceiling will only be a finish coat of plaster as it will be drywalled, not baled. If you use the Natural Hydraulic Lime (NHL) for the finish coat, increase the amount of lime in the mix to make it a bit stickier. You don’t have to do a lot. If you removed two shovels full of sand per bag of NHL, that would do it. If you are using the premixed finish NHL, you may want to run a bit more water in it to make it more workable. In other words make spread further. If you are using a different plaster, like earth or gypsum, the key is experimentation. You want the mix to be sticky, that is for sure. Be sure to use some type of joint reinforcement at the ceiling edges. This could be paper or fiber drywall tape embedded in the wall plaster and mudded to the ceiling. I would suggest you do the ceiling before the final coat on the walls but after the scratch and brown on the walls.